A truly intense movie. If you enjoy Tom Cruise stressing the heck out for two-and-a-half hours, this is the film for you. 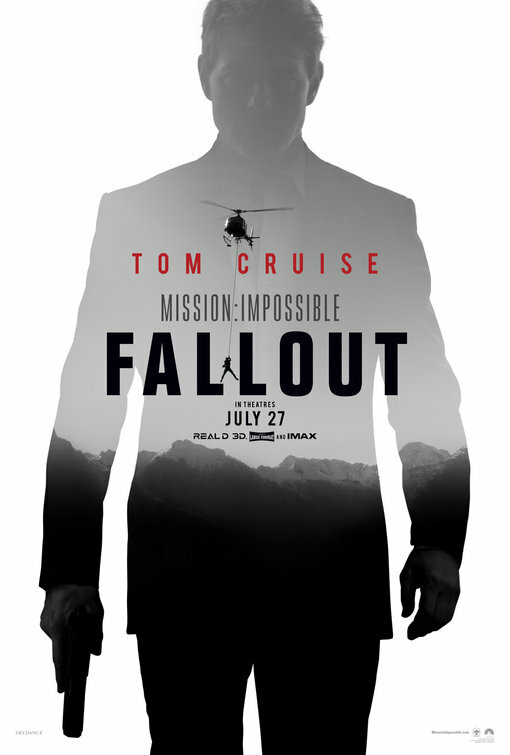 If you have been a fan of the past Mission: Impossible movies, this one will not disappoint you. Amazing cinematography and action sequences. A bit of a thick storyline. There are lots of past references to the previous movies and can be a lot to keep up with if you are unfamiliar with the series. Occasionally weak dialogue. The interactions back-and-forth were far less interesting than the action sequences, even cringe-worthy at times. Because the movie is so intense, it may prove to not be enjoyable for some people to sit through. With Mission: Impossible - Fallout, I have to admit: there were not enough nails to bite while watching this. If you have kept up with the five previous Mission: Impossible films, you are going to really enjoy this one. Once again, we follow Ethan Hunt (Tom Cruise), along with his team, including Benji (Simon Pegg) and Luther (Ving Rhames), in a battle of deciding between standing by his colleagues and following orders or taking action for the greater good and finishing the job of a failed mission. This time around, writer/director Christopher McQuarrie sets up a mission for Hunt to stop a terrorist organization from attacking well-known religious locations around the world with plutonium-powered bombs. The plutonium cores have gone missing and the stakes are high to once again save the world from potential destruction. In full disclosure, I was super skeptical walking into this movie. We have numerous action/suspense franchises already and I wondered if there was enough Mission: Impossible left to hold my attention. Let me tell you, I was pleasantly surprised. The audience was hanging on every action scene. Between the many “That’s got to hurt!” and “Ooh!”’s expressed by the audience, Cruise finds himself in the center of several elaborate stunts. And those stunts and action sequences are so well done, the overall pacing of the movie never slows. Fast-paced, this felt like a well-crafted train wreck that I thought would never end. And although the movie was a whopping 2 hours and 27 minutes, it holds the suspense factor all the way through. Be aware that there are many references to the previous Mission: Impossible films and actors from previous movies do make appearances. If you have not watched some of the earlier films, there may be some difficulty in following along with McQuarrie’s screenplay. New to the series is Henry Cavill (“Superman” in Man of Steel, Justice League), who plays CIA agent August Walker, Ethan Hunt’s new partner. Disappointingly, much of their dialogue sounds like two little boys arguing the whole time. After awhile, it all sounds rather weak and somewhat immature and I couldn’t help but let out a laugh at how these agents interacted with each other. Smart dialogue felt secondary to the scripting of bigger action scenes. In addition, McQuarrie cannot close a couple of plot holes that will likely leave you scratching your head. However, Cruise’s work, executing several stunts, is almost too insane to believe. It is the movie’s best and worst moments that while you have to be impressed that, at 55 years old, Cruise can pull off these scenes, those moments may be the only thing that everyone will be talking about. Overall, I enjoyed Mission: Impossible- Fallout, though I had my reservations. Entertaining to the very end, I recommend watching this on as big a screen as you can. If you are a die-hard Mission: Impossible fan, you will enjoy this. If you are new to this, or unfamiliar with the series, catch up on the previous films and then give this a go. Fallout is definitely worth it. Starring: Tom Cruise, Henry Cavill, Ving Rhames, Simon Pegg, Rebecca Ferguson, Sean Harris, Angela Bassett, Vanessa Kirby, Michelle Monaghan, Wes Bentley, Frederick Schmidt, Alec Baldwin, Liang Yeng.